This article is aimed to show how you can access data from oracle database via an odbc connection direct by using the gateway odbc agent (or program) generic connectivity. In this example, an odbc connection is made for excel but it's also of course valuable for other Database management system (DBMS). The principle is that Oracle see the Odbc data source as an instance and then you can access it via a database link. In the employee worksheet, highlight the range that you want to query from Oracle. The range should include the column names and the data. Ensure that the column names confirm to the rules for naming columns in the Oracle database. To configure the agent, you must set the initialization parameters in the Oracle Database - Gateway (Heterogeneous services) initialization file. Each agent has its own heterogeneous services initialization file. The name of the Heterogeneous Services initialization file is initSID.ora, where SID is the Oracle system identifier used for the agent. This file is located in the $ORACLE_HOME/hs/admin directory. # needed for an ODBC Agent. 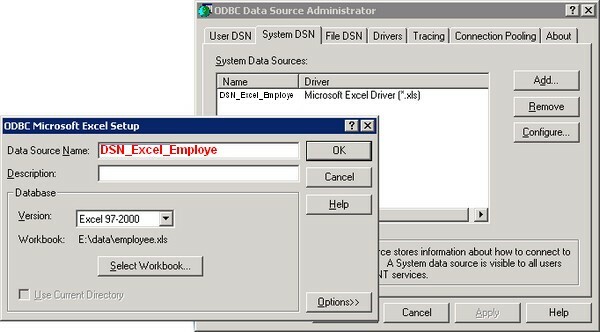 DSN_Excel_Employe is the name of the system DSN you created in the Create an ODBC System Dsn Connexion Step. 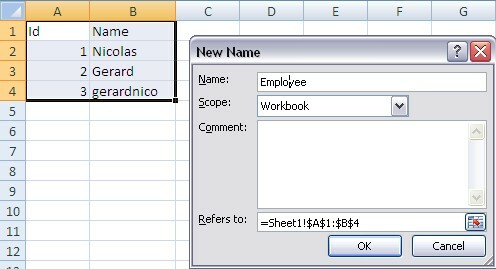 Excel_Employee_SID is the name of the Oracle system identifier used for the agent. The HS_DB_NAME and HS_DB_DOMAIN initialization parameters define the global name of the non-Oracle system. Set up the Oracle Database - Listener on the agent to listen for incoming requests from the Oracle Database server. When a request is received, the agent spawns a Heterogeneous Services agent. The SID_NAME parameter must contain the name of the configuration file you created in the previous step. However, it must not contain the init prefix. For example, if the configuration file you created in the previous step was initdb2.ora, then the value of the SID_NAME parameter should be db2. Ensure that the ORACLE_HOME parameter value is the path to your Oracle home directory. The value associated with the PROGRAM keyword defines the name of the executable agent and will differ for each type of data source. In versions prior to 11g: hsodbc. In Oracle Database 11g: dg4odbc. Remember to restart the Oracle Database - Listener after making these modifications. If you fire the command lsnrctl status, you must see the new Excel_SID service. Service "Excel_Employee_SID" has 1 instance(s). To be able to create the database link, we need to add a net service name in the tnsnames.ora file located in the $Oracle_Home>\Network\Admin\ directory. The instruction (HS = OK) is really important. Copyright (c) 1997, 2006, Oracle. All rights reserved. Username and password must be in double quotes to avoid that Oracle (in 10G) transform them in upper case because SQL Server is sensitive to the case. Ensure that the initialization parameter GLOBAL_NAME is set to FALSE to verify that the global naming is not enforced for the database link. the worksheets are seen as the tables and you need to add a $ to the end of the names. How Do I Load Data Stored in a Microsoft Excel File? You forgot to add in the tnsnames.ora the option HS=OK. The log output will be written to a file in the $ORACLE_HOME/hs/log directory. After you have made these changes to init<sid>.ora, restart the Oracle Listener.